Christmas is in the air above the English Countryside. With the yuletide, snow comes winds of change for Chise and Elias, even as a long December shadow begins to stalk the enchanted hills they call home. Chise gets secretly summoned for an excursion to bustling London on Christmas Eve. The alchemist Alice is waiting for her, and the two apprentices shop and reminisce together. Each of them begins to truly appreciate what kind of relationship they hold to their respective masters, both of whom saved them from despair. However, Christmas will not be an entirely pleasant affair for the Ainsworth household. When a local boy gets magically whisked away, it lures Chise, Ainsworth and the boy’s sister Stella into a magical hunt, one that may have dire consequences should they fail. At the best of times, Christmas is a magical holiday, a reminder of close-knit familial warmth and care that chases away the bitter winter chill lying outside among the frozen snowdrifts. It manifests a delicate balance of hope amongst the darkest of nights that makes it uniquely special. 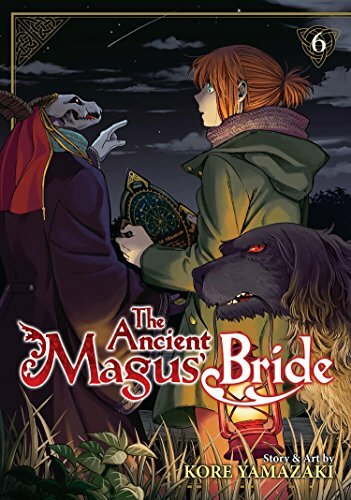 The Ancient Magus’ Bride Vol. 6 manages to harness this wealth of feelings into a delightfully magical mixture that brings forth another stellar volume from this enchanting series. The artwork, as clean and beautiful as usual, showcases some truly lovely compositions that bring all the warmth of the season to the reader while also managing to explore the encroaching despair the winter chill brings to the enchanted forests outside. Windowed panels give brief cosy glimpses of the character’s insular holidays, while bleak, open snowbanks accentuate the feelings of desperate loss amidst Chise’s fraught forest search. 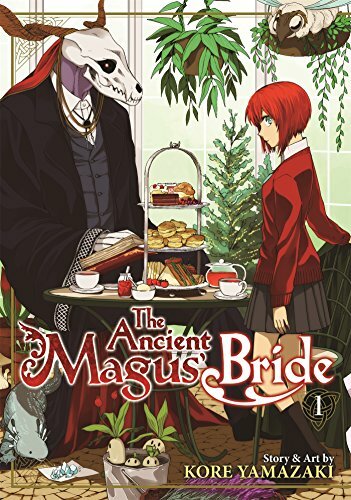 The visual symbolism through these classic motifs has always been a great strength of The Ancient Magus’ Bride, but the all-encompassing, symbolic richness of the season enhances the series’ traditional paganistic magic by bringing it together with one of the most ritualistic seasons. This gives the book’s storytelling the same animistic charm as its lore. In terms of the actual plot, volume 6 is another deeply engrossing story that continues to steadily forward Chise and Elias’ relationship and self-understanding while fleshing out the rest of the background characters. This time the thematic focus is clearly set on those of dependency and family. Chise and Elias begin to find tension in their relationship as Chise becomes more willful and independent, and grows more accustomed to her new place in the world. Her newfound independence, such as when she sneaks away to do some private Christmas shopping and later in her self-assured magical hunt, was wonderful to behold. Her actions clearly show deep-rooted growth and change for her character from the much more shut-off and out-of-her-depth person she was 5 short volumes ago. Similarly, Elias’ puzzled exploration of the ideas of kinship and jealousy in this book really begins to flesh out and deepen his relationship with Chise by showing how deeply the two of them are affecting each other. It is a lovely and heartfelt dynamic, exploring some of the tender moments of what it can feel like to fall in love. The story is poignantly human, as only a fantastical take on this subject matter could be. There are also two major storylines in this volume that follow the side characters. One is about the Alchemist Renfred’s bodyguard Alice, and the other is about Stella, a young girl who loses her brother Ethan on Christmas Day. Alice’s story is particularly interesting as it delves deeply into her past as a Junkie and drug dealer which left her in a desperate, self-loathing state before Renfred took her under his wing. I found the tackling of subjects like child abuse and drug use particularly gut-wrenching and emotionally moving. Although the manga feels a little preachy for a couple of pages when Alice gives a hard-line denouncement of drugs, it is definitely justified shortly afterwards by her backstory. Her whole tale feels like a very clear parallel to Chise’s own arc in a way that showcases the differences between the two apprentices and their respective teachers. I am quite looking forward to their further appearances as underlying shadow of Cartaphilus storyline comes back into focus. Alice is very much a foil to Chise and acts as a much more outgoing, determined young girl who pushes Chise into action to save Stella’s brother Ethan. I loved how their interactions force Chise to rethink her own relationships. 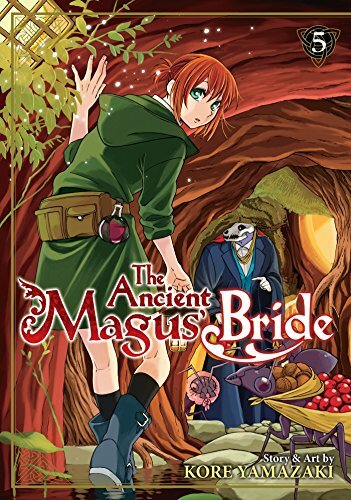 The Ancient Magus Bride Vol. 6 is another lovely addition to this ongoing saga. It manages to use everything from its particularly festive Yuletide setting to a specific selection of side character stories that reinforce the growth of its main protagonists. It is a beautiful, magical volume that warmed the cockles of my heart, chilled my bones, and filled me with seasonal melancholic joy. It encompasses everything I love about this series and makes me want even more of it. 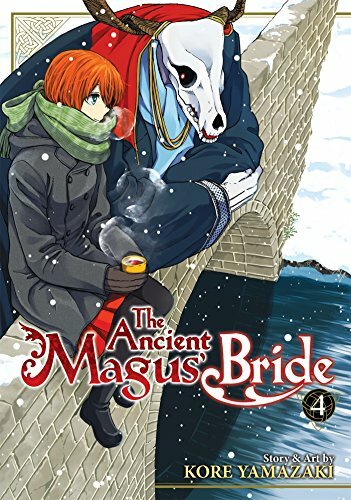 The Ancient Magus’ Bride Vol. 6 was published in English by Seven Seas Entertainment, on Jan 3, 2017., translated by Adrienne Beck. It covers chapters 26-30. The original work was created by Kore Yamazaki, and published by Mag Garden, in Monthly Comics Garden. Vol. 7 releases July 4, 2017.